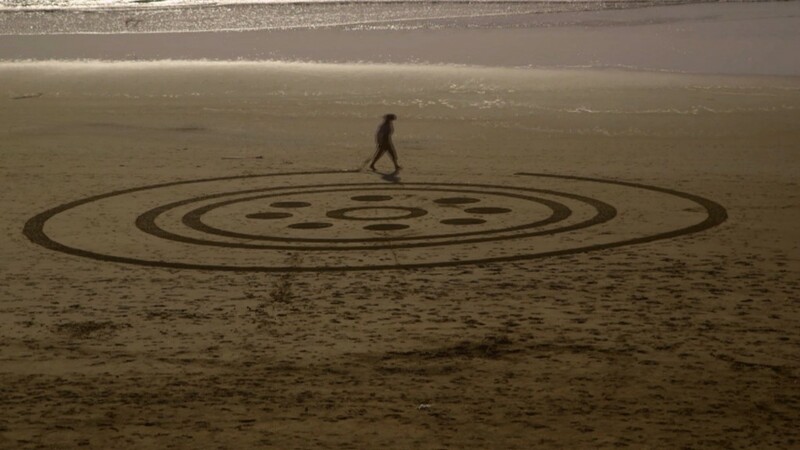 That’s how “earthscape artist” Andres Amador describes the moment it struck him that he could turn his studies of sacred geometry and fractals into large-scale artworks using the beach as his canvas. “I’d backpacked into this amazingly beautiful remote beach, Kalalau Valley, in Hawaii, and was drawing circles with a stick in the sand. And it was as though a bolt came down and struck me,” says Amador. His body began shaking as he visualized the possibilities; he couldn’t wait to get back to San Francisco to get started. Walking along Bay Area beaches, you may be lucky enough to come across one of Amador’s “playa paintings,” large-scale patterns he creates in the sand using rakes and ropes as his tools. His pieces originally embodied precise geometric forms, but over time they’ve become more free-flowing and abstract, seeming to emerge from and interact with the landscape. For Amador, picking the right time and place is part of the art. Once he has the perfect location, Amador must wait for the right tide and then work fast. He starts an hour before low tide and works until an hour after — two hours in all. “I love the focus and drive that that requires,” Amador says. The last regular job Amador had was 15 years ago, as a computer technician. “That didn’t last long,” he says. “I felt a yearning I could not understand.” He studied ancient geometry, created large-scale geometric sculptures and explored improvisational dance. 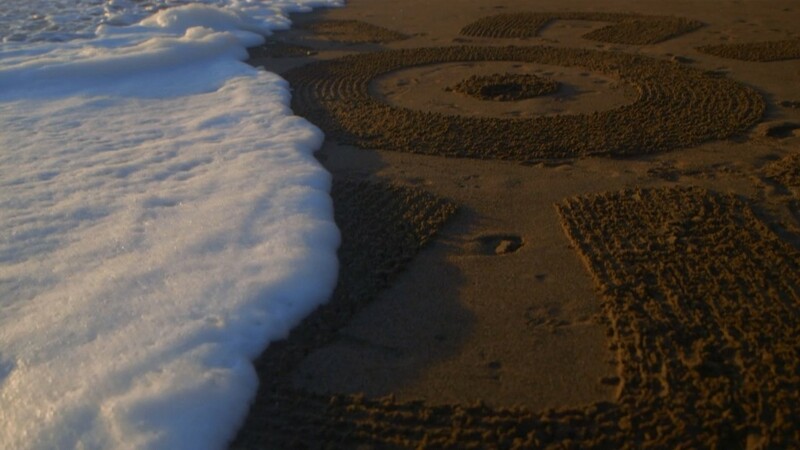 But when Amador created his first earthscape piece on Ocean Beach in San Francisco, he seemed to find what he was looking for. Since then he’s been creating commissioned work and installations for businesses and individuals across the U.S. and Europe. And Amador includes the public in the fun through his Playa Painting Workshops, in which participants collaborate to design and create their own large-scale sand artworks. Seen at work from above, Amador is a speck in the midst of a massive pattern. Down on the beach, however, the overall design is hard to see. Amador uses flashcards to sketch and index quick inspirations, then refers to them while realizing the piece. But still, he says, after the piece is complete there’s always that moment of suspense when he scales a cliff or sends up his drone helicopter to film from above. Local Beat is a weekly series on Art Beat that features arts and culture stories from PBS member stations around the nation.